Note: One additional retirement (slated for 2019) was announced in 2010 for Oyster Creek Nuclear Generating Station (614 megawatts) in New Jersey. Since October 2012, electric power companies have announced the retirement of four nuclear reactors at three power plants. The four reactors have a combined capacity of nearly 3,600 megawatts (MW). The recent retirements are the first since 1998. Decisions to retire the units involved concerns over maintenance and repair costs and declining profitability. The recent reactor retirements will decrease the total number of operating nuclear reactors to 100 and will reduce total U.S nuclear net summer capacity by 3%. Specific information on each retirement is included below. The most recent retirement announcement was issued by Southern California Edison (SCE) on June 7. SCE decided to permanently retire SONGS units 2 and 3 near San Diego. New steam generators were installed in Unit 2 in 2009 and in Unit 3 in 2010. In January 2012, a small leak was discovered inside a steam generator in Unit 3, and both units were shut down to evaluate the cause of the leakage and to make repairs. Both units have remained shutdown since then. SCE had submitted plans to the Nuclear Regulatory Commission (NRC) to restart Unit 2 at reduced power, and the NRC was reviewing the restart plans. However, concerns over the length of the review process and the high costs associated with steam generator repairs led SCE to retire both reactors. The potential effects of these units' continued outage was explored in a previous TIE article. In early May, Dominion Resources retired the Kewaunee Power Station in Wisconsin because of lower wholesale power prices in the region. Kewaunee, a merchant plant no longer associated with a state-regulated utility, was licensed to operate through 2033. Many of the power purchase agreements that the plant held with load serving entities in the region were expiring, and declining profits led Dominion to retire the plant. On February 5, Duke Energy announced plans to retire Crystal River Unit 3 in Florida. This was shortly after Duke had acquired Progress Energy, which had owned Crystal River. 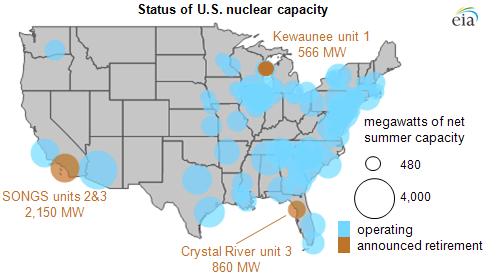 Crystal River Unit 3 was licensed to operate through 2016, and an application to extend the operating life of the unit to 2036 was under review by the NRC. Crystal River Unit 3 was shut down in September 2009 to refuel and to replace its steam generators. During the shutdown, workers discovered damage to the concrete wall of the containment building, and additional damage occurred during subsequent repairs in 2011. Although a 2012 report indicated that the damage could be repaired and the plant restored to service, the uncertainty surrounding the cost and timing of repairs ultimately led Duke Energy to retire Crystal River Unit 3. The coal-fired units at Crystal River will continue to operate. The loss of nuclear capacity from retirements is expected to be offset by the construction of five nuclear reactors with a combined capacity of more than 5,600 MW. The completion of construction at the Tennessee Valley Authority's Watts Bar 2 in 2015 is expected to add almost 1,200 megawatts of new nuclear capacity. During 2012, the NRC issued combined operating licenses for four new nuclear reactors at two plants: Vogtle, units 3 and 4 in Georgia, and Virgil C. Summer, units 2 and 3 in South Carolina. The four reactors have a total capacity of almost 4,500 megawatts and are now under construction, with target dates for completion between 2016 and 2018. There are also plans for capacity uprates at existing reactors. These plans include approximately 1,000 MW of uprate capacity currently under review by the NRC. However, Exelon Nuclear, which operates 17 reactors, recently announced that uprates previously approved by NRC, at LaSalle units 1 and 2 as well as Limerick units 1 and 2, will be delayed.